If you are a writer who teaches creative writing, this call for essays miight be just for you. Here is a letter from Scott Minar, the editor a book forthcoming from Autumn House Press. I would like to invite you to participate in developing a new collection of poetry writing exercises and an accompanying poetry anthology for Autumn House Press tentatively titled The Poet’s Work. I hope you will consider sending me a submission for this book. The Poet’s Work will be an exercise book, an anthology, and a textbook for poetry writing designed for undergraduate college or university students. In it, I hope to publish seventy-five of the best poetry writing exercises I can find. 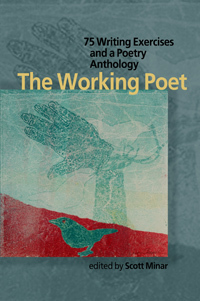 Should your work be selected for inclusion in The Poet’s Work, you will receive 2 copies of the book itself; and your work will be prominently displayed in what I hope will be a very popular creative writing textbook for years, perhaps decades to come. I hope that this will be an attractive project and expect to include some well known poets in The Poet’s Work, but I will also include the best exercises I find, regardless of status or reputation. It will include appendices with a variety of supplemental resources for ways to pursue poetry outside of the classroom as well. The overall structure of the book will be largely determined by the focus of the submissions I receive when considered as a whole, but I anticipate that chapters of exercises and examples might be formed around some of the following categories (or ones similar to them): Narrative Scenarios, Content, and Beginnings; Lyricism and Following Sounds; Rhythm, Form, and Meaning; Voice and Direction; Misdirection, Surprises, and Spin-Offs; Meter, Oralizing, and Performance; Conceptual Pieces and Meta-poetry; Revision, Alternating Versions, and Expansions. The overall design of the exercises in this book will seek to respond to a few questions for writing teachers, including the following: What makes a poem wonderful for you? How do you teach those features or aspects to students? Specifically, what kinds of exercises have you developed to explore or develop these features in student work? In addition, the sample poems and the anthology that will function as both examples of the exercises themselves and inspiration for writers studying poetry and generating drafts of their own work. These are the guidelines for submission: Each submission should include 1) a brief statement explaining what you like about this exercise and what it accomplishes or hopes to accomplish, 2) detailed instructions for the exercise itself, and 3) any student sample poems that have been generated by the exercise or examples from your own poetry that do the same or poems by others that you feel are particularly good examples of the exercise’s realized goals. With regard to this last item, you may of course chose to submit all three: student samples, examples from your own work, and references to poems by others that you use or may use when teaching this exercise to your students. Submissions via e-mail are most welcome. Attachments to an e-mail will be perfectly acceptable; however, you may want to copy and paste your submission into the text of your e-mail itself, as attachments—as we are all aware— sometimes generate difficulties. Please e-mail your submissions to minar@ohio.edu. If you would prefer to send a hard copy of your submission, please address it to Dr. Scott Minar, Ohio University Lancaster, 1570 Granville Pike, Lancaster, OH 43130. The deadline for submission to The Poet’s Work is December 15, 2008. Please be aware that your submission itself will constitute a “permission to print” acknowledgement from you to Autumn House Press. Please contact me if you have any questions. I hope you will feel free to share this call with others you know who might be interested in submitting an exercise. Thank you for your consideration. I look forward to hearing from you soon. Hi, what is the latest update of your anthology-poetry exercies book? Hi Raul, I’m not sure. You could email the editor and ask him though. Thanks for your interest in this project! and I will add the link too. Thanks for pointing out this oversight.